Rescue preparedness service in Denmark consists of the municipal rescue preparedness service - in the daily speech fire and rescue service (FRS) - and the national rescue preparedness – the Danish Emergency Management Agency (DEMA), i.e. 5 Regional Fire and rescue Support Centres with conscripts, 2 Expert Preparedness (nuclear and chemical), and 1 Volunteer Centre. It works to prevent, reduce and remedy any damage or injury inflicted on human life, property or environment as a consequence of accidents or disasters. 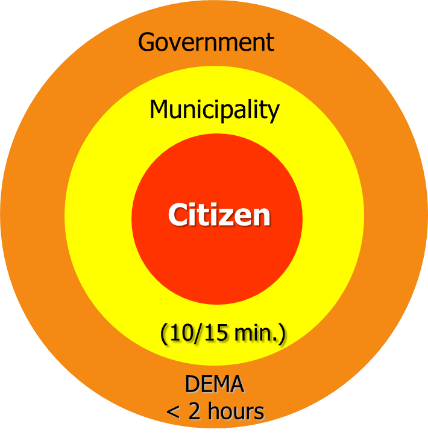 DEMA is decentralized and the basic principle of the Executive Order is that the municipalities must dimension daily preparedness based on an assessment of local risks. The municipal rescue preparedness tasks can be carried out either by the municipality itself or by the municipality agreeing to this with another municipality, a private rescue service or a volunteer fire department. More than half of Danish 98 municipalities whose are organized into 19 (24) FRS are privatized and owned of FALCK. Danish prevention activities are maintained at two levels i.e. national and municipal level (Figure 1). On the national level, the DEMA is responsible for a wide range of tasks relating to prevention which includes fire prevention, drawing up regulations and directives, providing advice and campaigns for the local or national use (www.brs.dk) . Prevention through rules and regulations is concerning to areas such as: fire and explosion; hazards in enterprises and storage facilities; operational directives for community centers, hotels, schools, etc. ; approval of major stocks of gases and flammable liquids; approval of enterprises covered by the Seveso II Directive due to fire and explosion hazard as well as regulations for transport of dangerous goods by road and approval of tanks. Also, there are provided supervision and advice to the municipal fire and rescue services and coordinates preparedness planning on a national level for accidents and disasters that may have a serious adverse impact on the critical functions of society. In addition on the national level, we manage, develop and implement a wide range of emergency management training courses. It also develops educational material and campaigns aimed at changing behavior and attitude in respect of fire prevention and emergency management. Each year several campaigns are implemented. Examples are: fire prevention campaign aimed at primary school children; national warning siren campaign along with full-scale testing of national warning sirens. In 2017 Denmark presented its National Prevention Strategy which will help the Danish Society to become more robust and resilient. The strategy has been developed in collaboration with a number of authorities and organizations that have participated in a working group. In addition, a wider range of authorities, organizations, associations, etc. Been represented in a follow-up group who has had the opportunity to comment on the strategy and has had the strategy in consultation. With the national prevention strategy the preparedness culture in Denmark will become more encouraged. In a number of incidents in recent years, including In connection with the storm called Urd in December 2016 and the storm flood in January 2017, we saw that many citizens are ready to take responsibility for their security and property and are ready to help others. This strategy would like to support. The strategy has two overall goals: (1) fewer ones will die or be injured as a result of fires, heavy storms and floods, and (2) the cost of injuries associated with the various events should be reduced. The level of deaths by fire per 100,000 population in Denmark remains low (Figure 2). Citizens' risk awareness, empowerment, self-help and helpfulness before, during and after serious accidents and disasters must be strengthened. It means that citizens must be in the centre and the strategy describes a number of ways that will lead to these goals. Not in the form of finished solutions or fully-tailored projects, but by pointing out some important areas of action and focusing on the groups most exposed. For example, there is focus on reducing the number of deaths due to fire where older people and other less resourceful populations are particularly vulnerable. But the focus should also be directed towards the general public. Everyone is basically a self-interest in the fact that they do not happen to themselves or their nearest. Therefore, there must be increased focus on how to improve their own general skills, e.g. within knowledge of the way in which emergency preparedness is concerned, awareness of alert and early warning and skills in relation to first aid and fire prevention, so that you become familiar with how best to intervene and help if necessary. There is talking about a comprehensive and cross-cutting work where some of the key words in the strategy are involvement and cooperation. The involvement of citizens whose presence, helpfulness and interest in their own safety is a good starting point for strengthening the overall preventive response to serious accidents. And cooperation with the citizens, who through local networks and projects can directly influence their own safety and security. For the authorities and other actors, cooperation is emphasized as a prerequisite for achieving the goals. The focus of the strategy on citizens, including the citizens' own role in preventing and remedying the consequences of accidents and disasters, does not mean that the role and responsibilities of the authorities are being prioritized. The National Prevention Strategy does not change in general sectoral responsibility, but points out that increased and renewed cooperation across authorities and private actors and across sectors and disciplines is necessary. 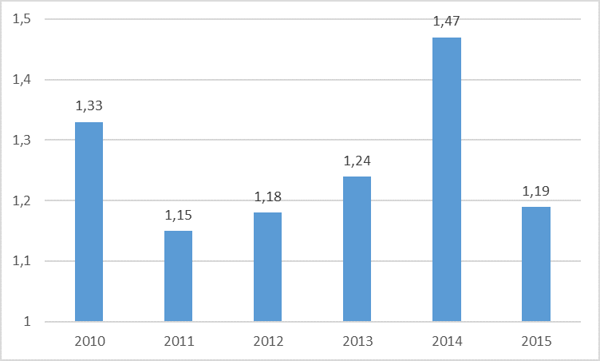 In Denmark, every year there publishes a national vulnerability report (www.brs.dk) . Frederiksborg Brand and Rending (FBBR) is a fire and rescue service authority that unites six municipalities (www.fbbr.dk . It consists of 16 FRS brigades – 6 municipal FRS brigades, 4 voluntary FRS brigades, 5 FRS brigades owned and staffed by a contractor (FALCK) and one FRS brigade owned by Beredskab Øst and staffed by a contractor. The governing structure consists of a commission and a director; its functions include operation, prevention, strategy and coordination. The commission operates as the board of the company and includes 22 full time staff members. Its assignment is to perform the management of the FRS. The members of the commission include mayors from all six municipalities, the police director or his deputy, a representative of the volunteers and the director (secretary). The task of FRS is to prevent, reduce and mitigate damage to persons, property and environment by accidents and disasters, including acts of war or imminent threat thereof. The goal of prevention activities is to positively change the behaviour of citizens. Prevention activities are funded from different budgets (from the policy committee budget, private funds or the operating budget) (www.trygfonden.dk ; www.sst.dk ). FRS in Denmark implements three types of fire prevention activities: informing, teaching, and counselling. These activities are mostly applied on the municipal level. Informing. Informing activities include local efforts – e.g. homepages/Facebook maintenance – and several nationwide activities – “Fireproof Midsummer”, “Fireproof Christmas” and “Fireproof New Year”, and Fire Safety week (www.brs.dk; www.brandbevaegelsen.dk ). The aim of homepage/Facebook page is to inform, advice and counsel citizens on how to avoid fire in different respects. This prevention activity’s frequency is about 6–7 times a year. Mass media campaigns are focused on citizens, primarily homeowners. Other types of campaigns happen on a regular basis, among others: smoke detector campaigns, informing people which detectors to choose and how to use them; “Fireproof Midsummer” campaign to inform on the safe behaviour during the Midsummer celebrations; “Fireproof Christmas” focused on the high risk accompanying Christmas holidays traditions (candle lights) and “Fireproof New Year” focused on the high risks associated with the use of fireworks. In addition to that, a Fire Safety week takes place every year in week 40. It is important to keep I mind that cause of fires cost a lot of resources every year. And it's not only the material values that can be lost in the flames. There are annually between 70 and 80 people in fires in Denmark. The Danish Emergency Management Agency focuses on fire prevention (www.brs.dk ) with education and information materials targeted at citizens from the “0” school class at the school to the elderly and vulnerable citizens. The goal is to reduce the number of fires in Denmark and to minimize possible negative consequences. School teachers and firefighters agree that the good habits of fire prevention, which are founded in childhood, follow the rest of life: Fire-proof children become fire-proof adults. The aim of the Danish Emergency Agency's educational materials is therefore that children should learn about fire and fire safety so that they become more aware of the hazards and can react properly if a fire occurs. More than 500 schools ordered the teaching materials 'Learn about fire' and 'Fire - a dangerous friend' in 2016 to 67,000 school pupils. Booking of teaching materials for week 40 is during the weeks before the busiest period because of many primary schools should have the material ready for week 40 where fire prevention is put on the school schedule. The materials are aimed at teachers and students in the 1st and 4th school class. Involvement of the fire services in the information sharing for schools, teachers are encouraged to consider the possibility of organizing a fire-theme day in which the municipal fire and rescue service (FRS) can be involved in the teaching. Contact to the fire department can be done via contact information on the municipality or FRS´s website. There is thus a good opportunity to test fire and evacuation exercises at the local schools about the teaching of the children in behavior and prevention related to fire. Teaching. There are several teaching and training activities targeted at different groups. Junior Fire Corps is a project that creates a framework for children and young people to learn safe behaviour basics and firefighting skills (www.ungdomsbrand.dk; ). A junior fire corps is a local activity that is active for 9 months (being established once every year). There are 2 instructors and eventual assistants. This activity targets children and young people 13–18 years in vulnerable situation. The budget is about 6 500 EUR. A training course for companies offers an opportunity to learn safety skills based on the operational regulations. The course includes escape routes, using fire extinguishing equipment, fire doors, fire and evacuation instructions, warning instructions, space distribution plans, inventory settings and fire detection. Each training is offered for a price of 4 337 DKK (about 600€) per course; it includes one instructor and is for 16 participants. The training is offered on a regional basis. This course targets building owners, representatives of the working environment, managers and operators in institutions or companies. At the national level, an interactive, web-based course “Fire-ready” is offered (www.brs.dk) . Counselling. There are several counselling activities in Denmark, which include general fire inspections and more specifically focused campaigns “Fireproof Home” and “Fireproof residential” (www.brs.dk). The aim of fire inspection is to control that the fire safety conditions are in place. If all conditions are not met, then, information and counselling on what needs to be changed, is provided. It is a regional activity. Fire inspections take place every 0–5 year for buildings covered by operational and/or technical regulations and involve 2 inspectors. This counselling activity is focused on owners, users, insurance companies and other authorities. Fireproof Home is a preventive effort designed to reduce the number of fires in which people lose life or are seriously injured. Since these fires most often occur in residences of a particular group (older single smokers with mental illness or abuse and often also impaired), the main focus of the activities is addressing the risk group in collaboration with home care. Visits takes place every month and are organized by 2 people. The aim of “Fireproof residential” is preventing heavy casualties as a consequence of fire among the elderly and other vulnerable people (in the form of visits). 2015: Inquiry dealing the behaviour of the population, about fire and the use of smoke detector. Campaign to inform people on how to behave during Midsummer celebrations not to cause fire, etc. Fire safety connected with candle lights, Christmas time traditions, etc. Safety connected with using fireworks. Every year in week 40. A course based on the operational regulation. Measures to take in case of fire. To reduce the number of fires in which people lose life or are seriously injured.